I’ve prepared some posts to tide you all over while I’m gone and look forward to catching up with comments and the blogs I follow when I return. But this post isn’t all about how I’ll off gallivanting elsewhere. I have some pretty yarn to show you, too! I love that Targhee is an American breed and I find her description matches what I feel, the overwhelming impression I get from petting it is sproinginess and loft. I can’t wait to swatch and see what it wants to be! Since there are so many wonderful yarns available at Blue Moon Fiber Arts other than their ubiquitous Socks That Rock, I was inspired to start a Non-STR KAL on the Socks That Rawk! Ravlery board. 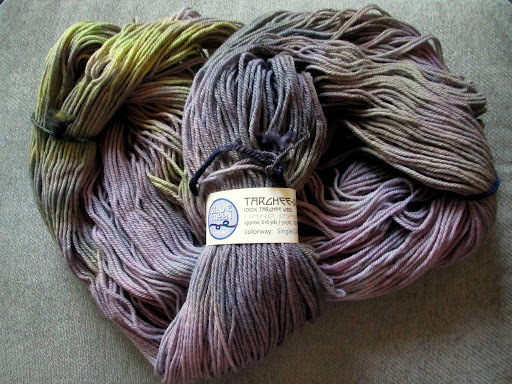 I’ve had a gorgeous skein of Mopsy yarn burning a hole in my stash for over a year and a half (eek!) and I can’t wait to get knitting with it. Why don’t you join along? We’ll be continuing the KAL from now through the summer so there’s plenty of time to fit one more WIP in and I think it’ll be a great way to see all the gorgeous colors Tina cooks up on different bases. Plus, there’s a (very rare) sale going on right now until 9 pm on May 8th, so what excuse do you really have not to join in? 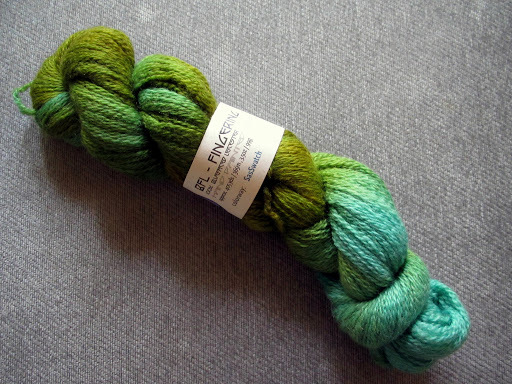 This entry was posted in BlueMoon, yarnaholic by shoelaceswitcher. Bookmark the permalink. I'm trying to be strong and not buy more yarn. But you are making this very difficult! New Blue Moon base and a sale?! That is a deadly combination. Have a safe trip, I can't wait to hear about your adventures.